On the corner of corner of Moneda and Licenciado Primo Verdad streets in Mexico City sits the first printing press in the Americas, established in 1539. Not far from that historic site of innovation is the Zona Rosa, one of many neighborhoods in the city center known for its trendy restaurants and bars – and increasingly – a lively startup community. That’s near where WeWork is located, a shared workspace that many young entrepreneurs call home. Based in the Bay Area with offices all over the world, the Mexico City outpost looked like any Silicon Valley shared workspace with its casually hip young crowd, micro-roasted coffee and micro-brewed beer on tap — and even a few dogs. So it was fitting SAP Latin America chose WeWork as a venue for its innovation event. 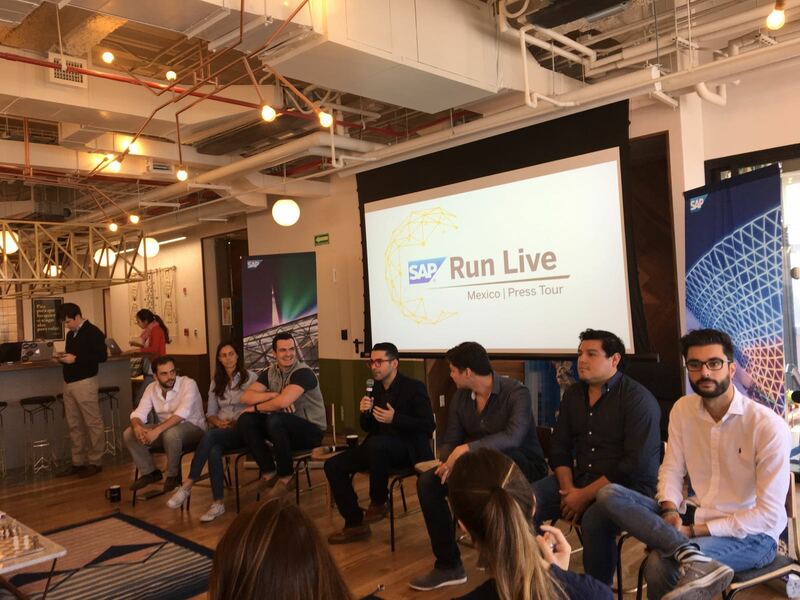 SAP and Endeavor – a global organization that supports social entrepreneurs – assembled a panel of young startup leaders to discuss how their companies are using technology to digitally disrupt everything in Mexico from the mid-range furniture market to domestic cleaning services. For example, Hassan Yasine is a co-founder of GAIA Design, an online furniture startup that brings affordable contemporary design to the rising middle class in Mexico. His award-winning ecommerce business is helping to digitize Mexico’s $77 billion USD furniture retail industry. GAIA’s innovative approach is an example of why many in the technology and investor community are at Mexico as one of the hottest startup ecosystems in Latin America. Every year the Tecnologico de Monterrey, known as the TEC, graduates thousands of students, well-prepared and eager to put their skills to work. Some estimate that Mexico graduates 118,000 students yearly in engineering alone, all looking forward to joining the country’s middle class (think: future consumers of GAIA). Government support is another reason startups are flourishing in Mexico, primarily through the creation of INADEM (the National Institute of Entrepreneurs) in 2013. The government has been investing heavily in entrepreneurial sector; and reports that in 2014, it distributed $658 million to an estimated 620,000 entrepreneurs. Finally, the startup funding and incubator ecosystem is one of the most – if not the most – mature in Latin America. The connection between Silicon Valley and Mexico City investor cash solidified in 2012 when the 500 Startups acquired Mexican.vc, a small VC firm that funded homegrown startups. The SAP Startup Focus Program provides participants with free SAP technology (primarily SAP HANA and SAP HANA Cloud Platform), technology mentorship, go-to-market assistance including connections to SAP customers and other services – all aimed at helping these companies scale and provide new innovation to the SAP install base, and ultimately generate revenue for both the startup and SAP. He explained that the Startup Focus Program looks for maturity of the startup environment as one of the key criteria to launch in those countries (alongside SAP’s presence in those markets.) “There are hubs in emerging economies. That’s where startups go for capital, mentoring and connections.” Mexico City is emerging as one of those hubs. Previta, the first company to join the program in Mexico, is committed to “revolutionize” the health system in Mexico and other Latin American countries, by offering services that monitor and control chronic illnesses. Using their “etracker” application, telemedicine, and a network of walk-in clinics, they provide services to insurance and managed care companies, and in turn assist millions of people with the prevention, early detection and treatment of these life-threatening diseases. Originally, Previta received a software donation from SAP to help run its backend (SAP BusinessOne, its business software for small and mid-sized business.) Now they are ready for a more strategic engagement and will deploy SAP HANA through the SAP Startup Program to bring their health platform to the next level – and fight chronic diseases like diabetes, hypertension and obesity even more effectively. Mexico City, which is built on an ancient lake, sinks inches every year. But for its startups, the sky’s the limit.